Spreading itself across our waterways like a lush green carpet is one of nature’s enemies, growing up to 20cm a day and suffocating native plants and fish. Floating pennywort, originally from America, is an invasive plant that arrived in the UK in the late 80s and has since caused havoc in the environment. As well as having a harmful impact on the biodiversity, it is also restricting our flood alleviation structures in the rivers. 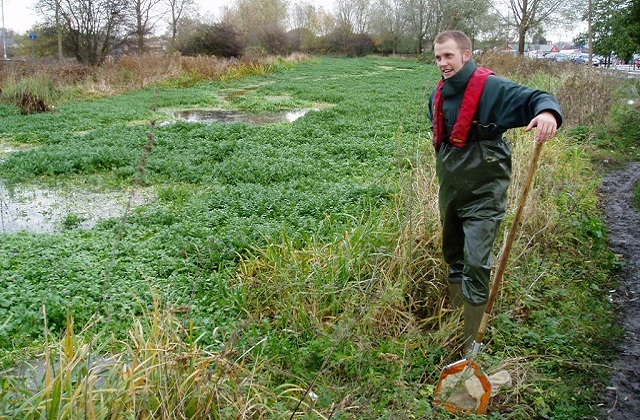 The plant is prominent in the east, in particular along the Chelmer and Blackwater catchment in Essex, but thanks to good partnership work that has developed in recent times, we are making progress. I first became interested in this subject while studying at Glamorgan University in 2003 where I began researching its detrimental effects on invertebrate and fish populations. 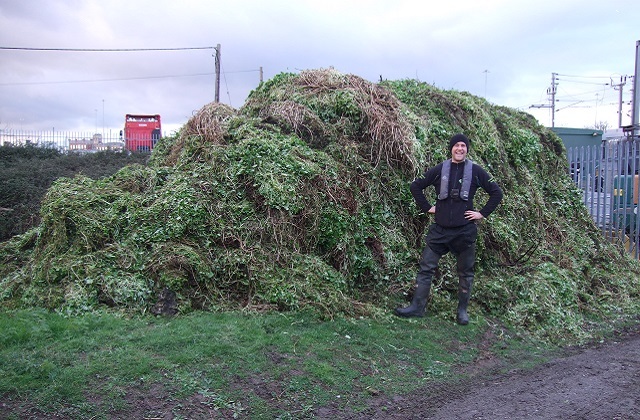 Now as part of my role as a fisheries officer for the Environment Agency, I am often involved in clearance operations to rid rivers and canals of this fast-growing weed. It usually begins to spread around late April/May and it is possible that it may be worse this year due to the warm winter we experienced, meaning it hasn’t died back as it usually does during cold spells. One of the areas most affected was the Blackwater canal near Chelmsford and Maldon, which had been taken over by the invasive plant. It is thought that someone emptying the contents of their fish tank into the river probably caused the pennywort's arrival in the upper Chelmer and Can rivers. Some parts of the canal were completely covered back then, which severely reduced oxygen. This meant recreational activities such as fishing and boating were unable to take place and there was a risk to livestock, dogs and human health. In 2004/05 the Environment Agency, the Canal Trust, and volunteer groups came together in a huge effort of manual clearance and herbicide treatment to help eradicate the weed. Since then our relationship with community groups such as fishing clubs and the Rambler’s Association, has grown, which has improved our resources to tackle the issue. Sections of the Blackwater catchment have experienced new growth since then and although this is only limited to small pockets, the potential for spread is high. 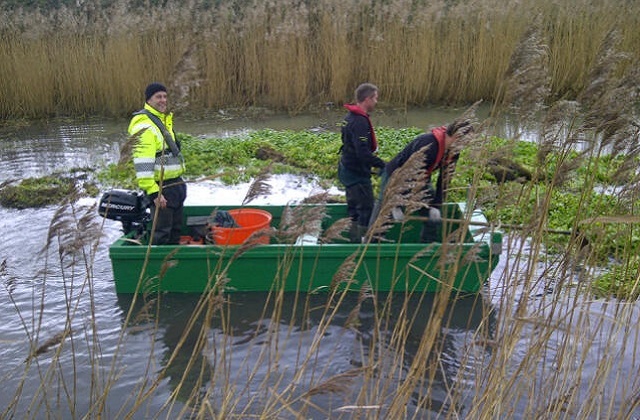 This year I worked with our operations team to remove floating pennywort from Dock River at Parkeston. Due to the habitat and fish populations that are supported by the weed, spraying and removing it by using the large weed cutting boat would have been extremely harmful, possibly resulting in fish deaths. Instead we used small boats to drag the weed to one removal point, thereby minimising water quality issues and preventing the need to cut back the important fish and water vole refuge. The only way to prevent growth is early intervention so it is vital that people who spot this in the waterways alert us as soon as possible. By stopping the spread at an early stage, it is much more cost effective than attempting to control species once it has become established. However we need the public’s help to do this. Thanks to our PlantTracker app, people can now easily identify it and then report it to our 24-hour incident hotline as soon as possible on 0800 80 70 60. I have recently moved to a house on the River Wey KT13*XF and the river has a growing problem with Pennywort. I sopoke to the Environmental Authority who said as riparian owner it was my job to clear it. I said it might be the whole way from Weybridge to Guildford with hundreds of owners. The thenput me to the pollution department who said I must report it to the police. I had experience with invasion of Water hyacinth and covering tropical rivers from bank to bank and experimented with composting but little job. We don't take reports for any other areas as it remains the landowners responsibility to control the plant. For the North East, the Environment Agency and the Rivers Trust are co-ordinating the eradication work which started in April 2012 and will last for approx 3 years. For the Fossdyke Navigation we're working with the Canal and River Trust to eradicate the species. For any other area, customers will need to manage the plant themselves. I live by the Wargrave reach of the Thames, where Floating Pennywort arrived in October 2017. I immediately reported it to the Environment Agency, who first said plants were nothing to do with the EA and told me to talk to Natural England ! Secondly they said that the problem was “ unreportable” because “it is the landowners responsibility”. This is complete nonsense and the EA must stop it and accept their responsibility. By definition this is a floating weed and the EA has known about it for years and has allowed it to float down from the Reading area of the Thames to Sonning, to Shiplake and now to Wargrave. Next stop Henley. The fact that the stuff sometimes attaches itself to the bank, does not make it the riparian landowner’s responsibility. I have written to James Bevan, the EA Chief Executive, under whose watch this disaster has occured. No answer as yet (whatever the crisis, this bureaucracy has a charter that gives itself 10 working days before it responds to anything). Phone 0800 80 70 60 to report out breaks of Pennywort to the EA . I am Chairman of ousefishing.com and we are working on the problem with them on our waters . It is not a landowners responsibility, the EA have a legal duty to maintain and improve the environment. Pennywort removes light and Oxygen from the water and will eventually kill off the invertebrates who are an essential part of the chain of life in our rivers .